In late October we finished up raw coins for a bulk submission by VSS to PCGS. We were not expecting that submission to come back until January, but in mid December it showed up. Of the 100 coins submitted, 74 graded. We submitted several coins that we thought were on the edge of grading so the success ratio was pretty good. We have a new 40 coin submission in to VSS and those coins will be added to the web site as soon as the images are available. In the group were two VAM 5 - O/O, Doubled Right 1; one VAM 1D - Flaky Eye; and two VAM 27 - Doubled Ear coins. So this is a nice batch for adding to the most desirable VAMs. An additional VAM project is expanding our VAM 5 inventory to study how the VAM 5 looks at much lower grades. We started searching for the lower grade coins in October and have already located a few. Currently we go no lower than AU 58 and there are much lower graded coins out there to find. And then on November 20 we got sniped on eBay and became a victim of our own success. 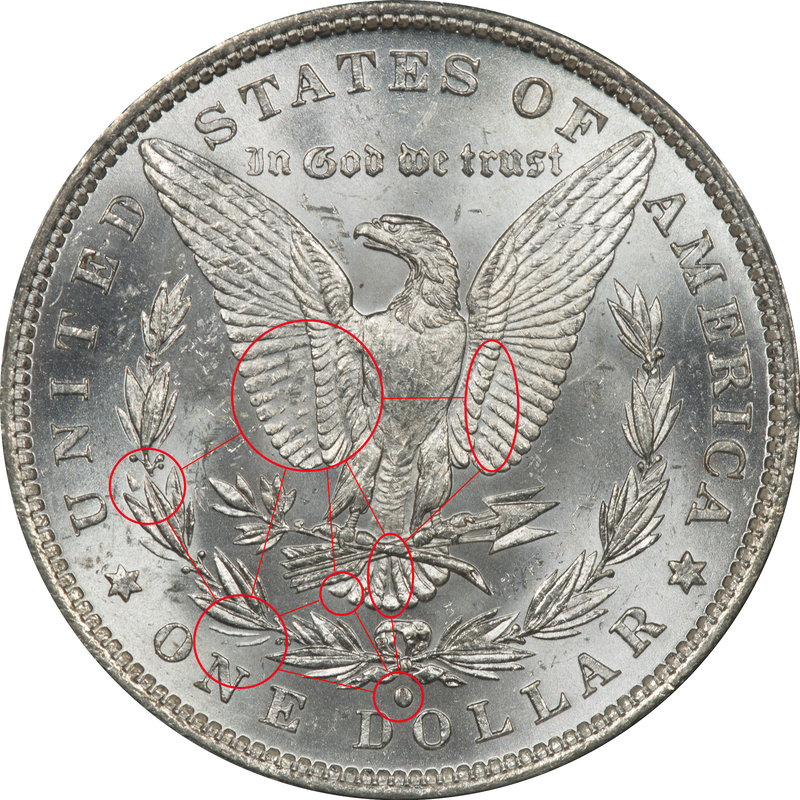 Earlier we explained how to identify a VAM 5 coin by just looking at the hair curls. On November 20 a dealer put up an MS64 VAM 5 with really bad, fuzzy pictures for $215. We immediately put in an offer of $190 and before the seller could respond someone came in with a full price offer. It is nice to know that our research is working, but sad when it works too well. Next time we will jump in for full price. Our hat is off to the sniper, you got us this time! Sometimes we swear that there is collusion in the market when we start looking for a particular VAM. As noted above we are working to expand our VAM 5 inventory. But no sooner that we started working on that VAM, the coins dry up. We swear that coins seem to come in spurts. We will see many clashed coins at once and then they dry up. Then in the latter part of November several VAM 1D coins suddenly appeared on eBay, all circulated at various grades. Then there was a PCGS graded one on Great Collections and another on Heritage. Maybe VAMs somehow flock together? Whatever the reason they are in season, so while we wait for VAM 5 coins, we are scooping up VAM 1Ds. The second is a new VAM 71 and this new VAM is also credited to Jim Longe. When more details are available we will post them here and on VAMworld. Both of these coins were in the VSS batch mentioned above and when the images arrive we will put them up on VAMworld. We initiated an interesting discussion on VAMworld concerning how to "sunset" a VAM when it cannot be proven to exist. Our direct concern is VAM 29, and VAM 21 enters into the discussion because of illustration, not because we feel it should be retired. To explain let's first look at VAM 21. We discovered quite by accident that the discovery coin is listed on the SSDC site as an MS 64 ICG certified coin. So far as we can tell no one has come forward with another certified copy of VAM 21 since its discovery back in 1980 by Martin Field. We do not doubt the existence of the VAM 21, only that no one has documented a second one in 36 years. Since there is no photographic evidence of the discovery coin, through VAM 10 you can at least know what to search for when looking. VAM 21 shares a reverse with VAM 10, yet the obverse lacks the date doubling or tripling of the VAM 10. They are two different die parings where the VAM 21 has Die 1, and VAM 10 has Die 5. Adding to this hope is that on VAM 21 the missing die pairing is Die 1, not some obscure die that has only been seen once. VAM 29 was discovered by Herbe Zepke back in 1998, which does not seem so long ago, but it was 18 years back. Like the VAM 21 no one has come forward to document owning another one. We do not doubt the existence of the discovery coin, only that it cannot now be examined and no one seems to know where the coin resides. We wish everyone a Merry Christmas and Happy Holiday. Maybe, just maybe, this is the year that the one missing VAM you have been seeking shows up in your stocking. In July we found a similar proof like coin without the usual deterioration and this coin can potentially be either proof like or deep mirror proof like. So the development of the error and the progression of the die state may be illustrated if we can just find enough of them. If nothing else it is something to work on during cold, wet winter nights.